In a medium bowl, whisk together fish sauce, lime juice and zest, brown sugar, honey, garlic, ginger and jalapeno. 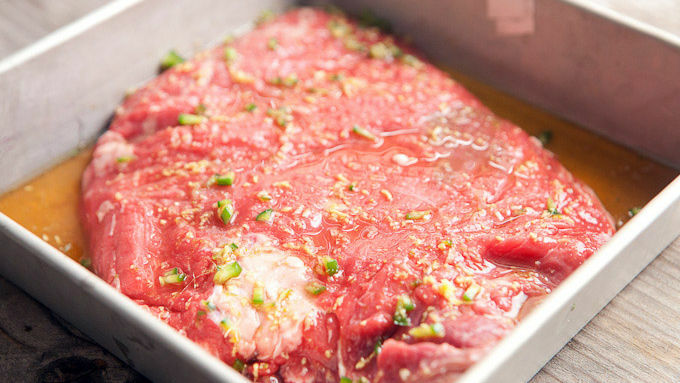 Pour half of the marinade over steak and let sit for at least 30 minutes (or overnight). Reserve the other half for salad dressing. Preheat grill to High heat or prepare charcoal grill for direct heat grilling. 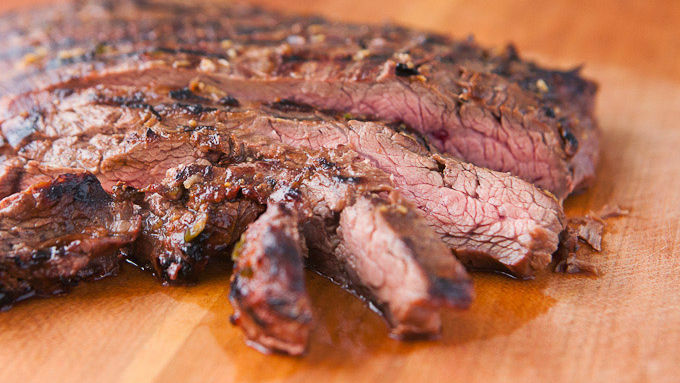 Grill flank steak for 5-8 minutes per side, depending on thickness. Pull steak when it hits 130-135° F in the thickest part of the steak. Use a meat thermometer to make sure you get it right. Cover cooked steak with foil and let rest for 10 minutes. Slice steak across the grain and serve over the veggie salad with rice noodles and reserved sauce/dressing. 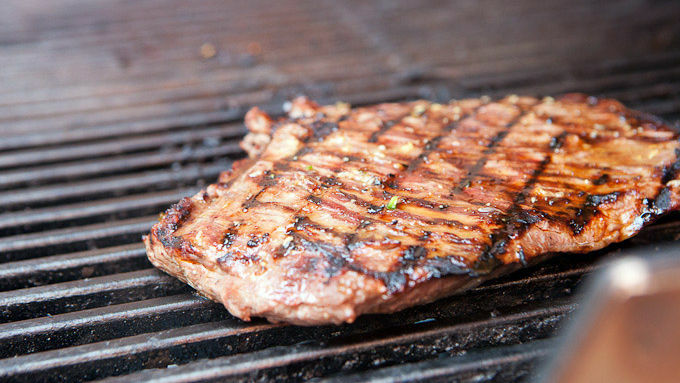 There’s a little known secret in the cooking world: Asian cuisine can really nail a steak. With all the rubs and steak seasonings marketed these days, you wouldn’t think it, but many Asian cuisines cook better steaks than cowboys or fancy BBQ experts. The secret is all in a slightly spicy, savory, and sweet marinade. It gives the steak great flavor and makes it perfect for slicing over salads, adding to noodle bowls, or simply eating with a fork and knife! To start, let’s talk about this marinade. You don’t need a recipe exactly, but what you want is a mixture of fish sauce, citrus juice (I like lime), brown sugar, honey, garlic, ginger and chili pepper. What you don’t need is salt. The fish sauce is really salty on its own and the steak will have plenty of seasoning with the marinade. At a minimum, let the steak sit in the marinade for an hour, but you could do it up to a day in advance! 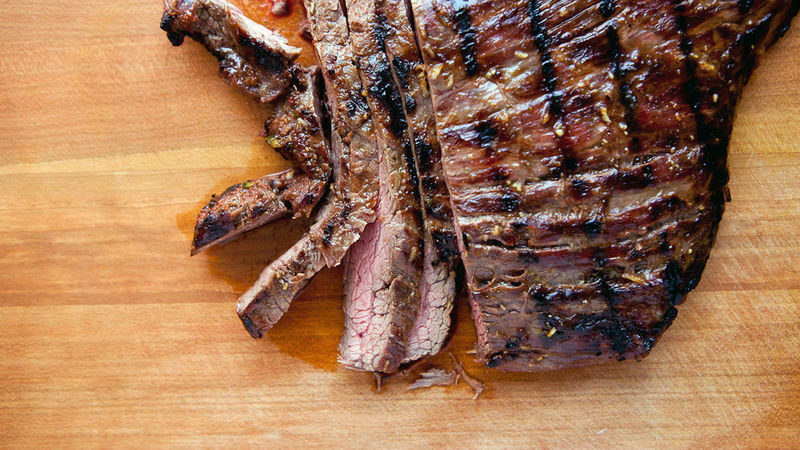 While you could use any steak for this method, I think flank steak or skirt steaks work best. While your steak is marinating or cooking you always want to think about what to serve with it. I prefer a light, colorful salad topped over rice noodles. I’ll drizzle a little of the same marinade mixture over the salad also as a quick salad dressing. (Obviously don’t use the same batch that you used to marinate your steak though!) As always, I recommend using a meat thermometer to make sure you don’t overcook this fine piece of meat. Ideally, your steak would hit about 130ºF in the thickest part. It’ll continue cooking up to about 135ºF while it rests, which will be perfectly medium rare. You want to let the steak rest for about 10 minutes before slicing for maximum flavor. Cover it with foil while it rests to keep the heat in. This is a great twist on a classic steak and any meat eater will love it!